Spitfire List | Is This Julian Assange? Posted by Dave Emory ⋅ December 16, 2010Post a comment Email This Post Print This Post Tweet This! 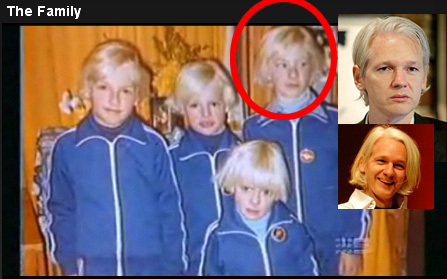 In an e-mailed comment on FTR #724, a listener contributed this photo comparison of Julian Assange with members of the Hamilton-Byrne cult in Australia. I came across this information: If you could get access to a software called Mandrake Biometrics, maybe that would allow you to make a call on these pictures. The software uses recognition patterns of faces, features, using different elements. It is sometimes used to determine the identity of a deceased. It’s worth enquiring.This system has been already in use in the United Kingdom by polices forces, and as surveillance equipment. I hope this will help you. It’s a show in Australia called sixty-minutes, and they did a short on the cult in 2009. You can see a picture of a youg Assange at the beginning of this YT video, and again at 2.11. As you can see, he had blonde hair, not white.